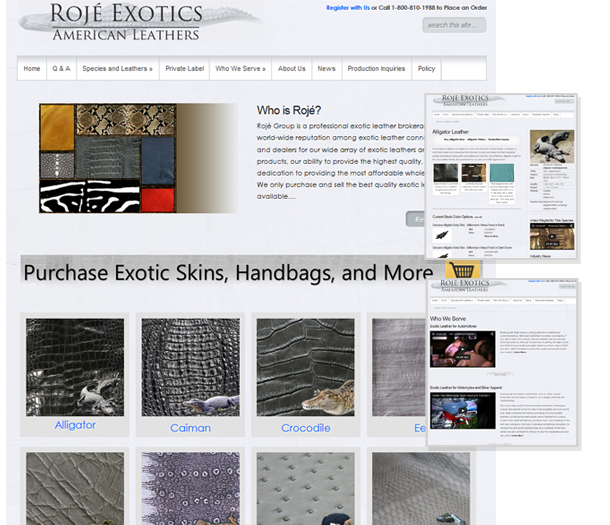 Roje Exotic Leather is an international brokerage for exotic leather skins and luxury goods. The best service I have experienced professionally. Rojeleather.com is a global brokerage specializing in exotic leathers and has been a productive client for over eight years. This website is built on the trusty WordPress platform to be the easiest most robust site in the industry and secure prominent Google search positions for keywords including exotic leather, exotic skins and more specific, product-related keywords. Since its most recent design in February 2012, the website has grown by nearly 50% unique visitors and a substantial increase in lead generation.